Rancho Las Cruces is set on over 12,300 acres of land in the desert landscape of Baja California Sur, with 36 rooms and spectacular views of the water. It’s an ideal retreat for rest, relaxation and offers a variety of activities to suit every taste, from lazy days on the private beaches to tours of nearby Cerralvo Island and more. The hotel is owned by a family who has dedicated itself heart and soul to the hotel industry; at Rancho Las Cruces they have elevated service to new heights, offering their guests a personalized experience. The closest airport is at La Paz, however you can also fly to Cabo San Lucas or San José del Cabo and the hotel can help you coordinate transportation from any of these locations. You might want to bring along a change of clothes for some active pursuits: the grounds are crisscrossed with 13 interpretative hiking paths (every room has a map with directions) and the resort also has a fitness track. The surrounding nature is swoon-worthy: the desert is absolutely gorgeous and the sunsets are magnificent. This is a fantastic place to bring your family on an unforgettable holiday where they can coexist with nature and leave the daily routine far behind. There’s an amazing array of activities for everyone at every age; those who simply want to relax will find plenty of places where they can kick back and dedicate themselves to… nothing at all. The staff at Rancho Las Cruces is also one of their highlights: they make guests feel completely at home and are attentive without being intrusive. While you're there, ask your favorite staff member for an anecdote about the hotel–the stories are plentiful! It’s ideal for families, nature lovers and, especially, those who love to fish. It’s great for family celebrations, particularly weddings, and couples will find it an excellent venue for a honeymoon or an anniversary celebration. 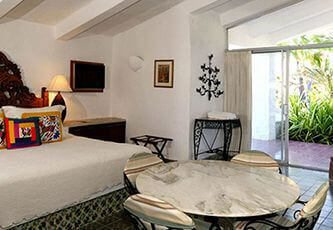 The rooms are decorated in a traditional Mexican style evoking the Old World. 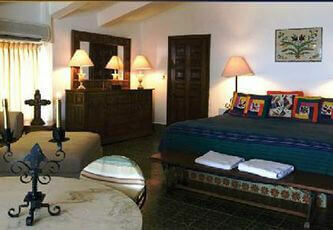 With handmade furniture, hand painted talavera tiles, wood fireplaces, sealing vents and air conditioned. 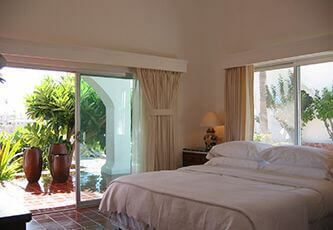 With king size bed, full bathroom with shower, private terrace with sitting area and pool view & partial ocean view. 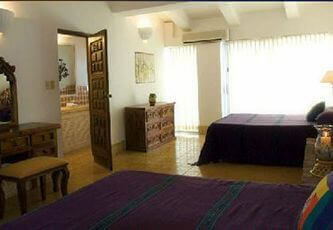 Queen size bed, full bathroom with shower, small living area, terrace with sitting area and pool view & partial ocean view. Two single beds, full bathroom, living area, terrace with pool view & partial ocean view. 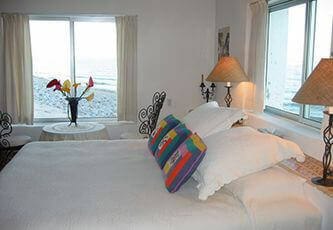 King size bed, full bathroom, living area, terrace with sitting area and ocean view. Queen size bed, full bathroom, living area, terrace with sitting area and ocean view. Cancellations received more than 30 days prior to arrival date will not have a penalty charge. Cancellations received less of 30 days and more of 7days, the hotel will keep the deposit for a period of one year for a new confirmation. Cancellations received less than 7 days prior to arrival date the deposit is not refundable. Welcome cocktail, full meal plan (breakfast, lunch and dinner), wireless. Check - In: 1:00 p.m. | Check - Out: 12:00 p.m.
Transportation from La Paz International Airport via Suburban with adittional cost. The trip is for approximately 45 minutes. 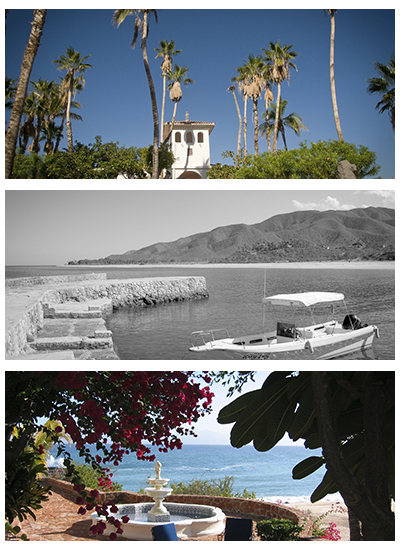 The hotel can also coordinate airport transfers from San Jose del Cabo airport, via Suburban. The trip is for approximately 3 hours . At Rancho las Cruces you can have a la carte breakfast, with a variety of eggs, cereals and fruits. You cannot missed the coffee which is Colombian. The dishes change constantly and they do not have a particular type of cuisine, for lunch and dinner they have a fix menu that changes every day. We suggest notifying beforehand if you have any dietary restriction. They have a wide variety of wines and liquors.